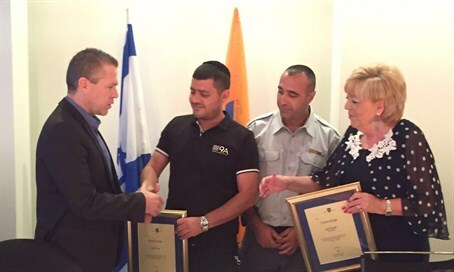 Two civilians who showed great bravery in neutralizing knife-wielding terrorist last week receive citations from minister and mayor. As Israel was reeling from the news of the murder of Hallel Ariel last Thursday, another terrorist began stabbing people in the streets of Netanya, wounding two. It was only due to the bravery of passersby that further damage was prevented. Public Security Minister Gilad Erdan joined Netanya Mayor Miriam Feirberg-Ikar in awarding citations to city warden Malak Farhan and Golan Yosifon for outstanding bravery in crisis. Farhan and Yosifon spotted the knife-wielding terrorist, pursued him, and neutralized him. In a Facebook post, Erdan spoke about the importance of recognizing the actions of citizens who combat terror on the streets. "I salute the heroes," the Minister opened. "Today I, together with Mayor of Netanya Miriam Feirberg-Ikar, awarded citations to Malak Farhan and Golan Yosifon who subdued the terrorist who committed the stabbing attack in the Netanya market last week. "These two heroes charged a terrorist armed with a knife and neutralized him. They join a long list of citizens nationwide: Policemen and policewomen, security personnel, civilians with or without weapons; who in recent months have saved lives during terror attacks." Minister Erdan pledged, "I will continue to promote the right of trained citizens to bear arms, while strictly enforcing appropriate standards. At the end of the day, an armed citizenry is an element that gives great help to security forces."